The walking tour of the city starts from the port of Palermo, where the guide will welcome you to Sicily. 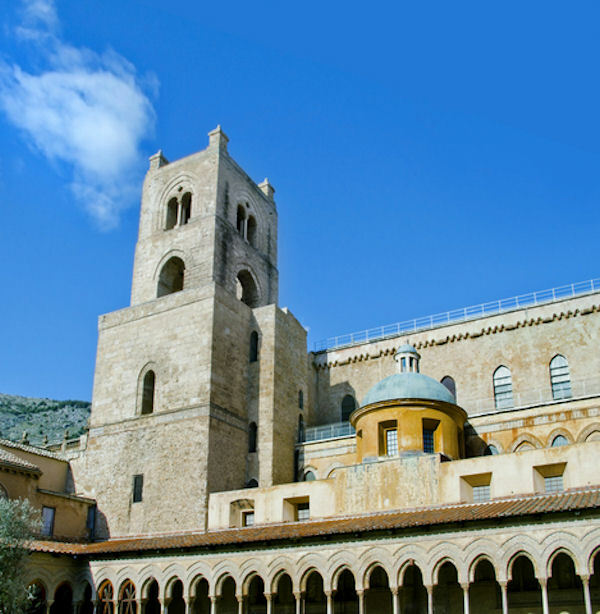 Head to Monreale and visit its wonderful Cathedral, the ultimate synthesis of Arabic decorations and Norman architecture. It’s simple facade and bronze doors, with biblical scenes in relief made by Bonanno Pisano in 1185, don’t prepare you for the magnificent sight you will behold once you step inside: you will be astounded by the golden mosaics which cover the walls almost entirely. Considered the largest and most outstanding in Italy and second largest in the world after St. Sophia in Istanbul, your eyes will be naturally drawn to the apse with the image of Christ Pantocratore. Then the guided visit will continue with the Cloister of Monreale, characterized by 228 columns decorated with mosaics and carving. Later, return to Palermo and for the guided tour of the Capuchin Catacombs, burial catacombs which are a tourist attraction as well as an extraordinary historical record. This monastery is famous for the presence of a cemetery in the basement that attracts the curiosity of many tourists now and since the last century: as a matter of fact, it was an obligatory stop of the Grand Tour (it was visited also by Guy de Maupassant). The catacombs contain about 8000 mummies that line the walls. The halls are divided into categories: Men, Women, Virgins, Children, Priests, Monks, and Professionals. Some bodies are better preserved than others. Some are set in poses; for example, two children are sitting together in a rocking chair. A taxi will bring you at the Seaport at the end of your tour. Don't forget your camera. Please note a portion of this tour is walking.